Environmental regulation has come of age in recent decades as the blunt methods of command-and-control have been subjected to trenchant criticism from both economists and lawyers in the United States and Europe. As a result of this intellectual development, as well as continuing and increasing severity of environmental problems, there is a need for fresh thinking about regulatory methods that are rational from both economic and legal points of view. 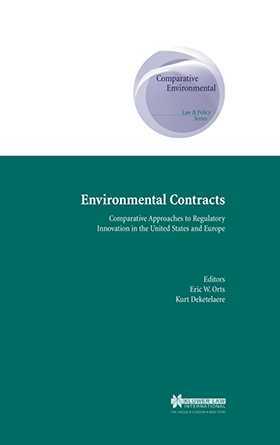 This book focuses on the viability of one particular regulatory innovation--the use of agreements or contracts for environmental regulation--as it has been practised in the United States and Europe. The various contributions explore the general idea that certain kinds of environmental problems may best be addressed through contracts among interested parties, including representatives of various levels of government, business, local community and employment representatives, and public interest groups. The parties get together to discuss a particular problem and then agree to an agreement or contract designed to address key issues and interests. At least in some situations, this approach may yield greater flexibility, stronger commitment, and more creative outcomes than traditional command-and-control regulation. Experiments in the use of environmental contracts have begun on both sides of the Atlantic, a fact which makes the comparative study offered here especially timely and valuable.